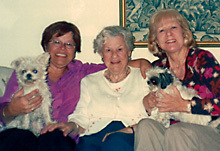 Jan was 6’4" and Hertha was 5’4"
Arizona, 1985; Papa passed away 1988.
with Monica’s dogs, Arizona, 2003. 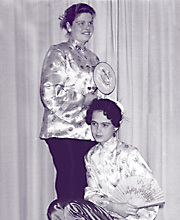 1956: Carin and Loes (Louise) my classmates in The Hague. Carin is married, has children and grandchildren and lives in France. Loes is single and lives in Spain. My Vienna friends with whom I had a wonderful time. 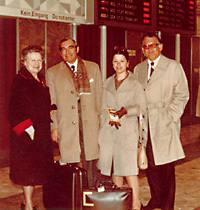 Frances, standing, from Boston, was a physicist, and Monica, from Australia, was an editor. Both worked for the IAEA (International Atomic Energy Agency). I am still in contact with Monica. 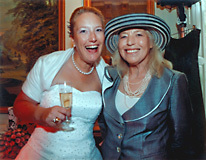 Annette and Suzan, at her wedding, August 2008. I met mother and daughter in June, 1974, in Halkidiki, Greece. I often visited the family in Holland. 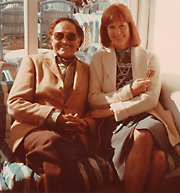 Luigi, we also met in Halkidiki, June, 1974; with Annette and her husband we had a great time. Luigi loved to dance. Aunt Olga, Luigi, Sister Monica and Papa. Spain: Ahmad and I with Persian friends at New Year’s Party, Casino Torrequebrada, Costa del Sol. Ahmad liked going to "shows." Ahmad and I at our favorite coffee shop. 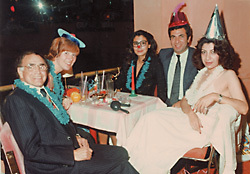 Spain: Ahmad’s favorite Cousin Homa in black dress with very nice friends who now live in L.A. Homa spends her time between Paris and Tehran. 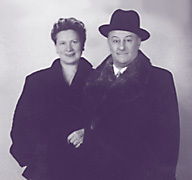 My Viennese "Family" – Günther and Brigitte. I know Günther since he was a teenager. 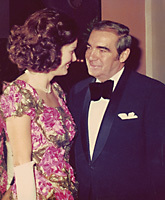 He and his wife took wonderful care of Aunt Olga when I was away. 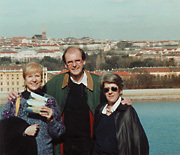 This picture was taken by Martin, their son, at the Gloriette of Schönbrunn near Vienna in 2001. View of the city in the background. We email every week. 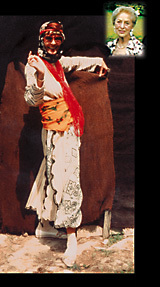 Little Me in Turkey, September 1988. 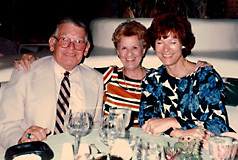 This photo was taken by Betty (Gordon) Boyd, my fairy, with whom I still correspond. (Inset) It is Betty’s photo of me that reminded me constantly to continue doing research on Stone Age foodstuffs and finish my Neolithic Culinary Delights.